Step 1: Put the coriander, cardamom and cumin seeds in the non-stick saucepan with the 4 cloves. Give them 1-2 minutes over a medium heat. Remove them and place them into a pestle and mortar. Grind until a powder. Step 2: Add the rapeseed oil and onions to the saucepan. Cook till soft. Step 3: Add in the lamb and sear on a high heat. Step 4: Bring down the hear and add the ground spices as well as the turmeric, crushed garlic, grated ginger and chopped chilli. Step 5: Next pour in the water, stock cube and tin coconut milk. Stir well. Either place in the slow cook overnight or once boiled, bring down the heat and simmer for 1.5 hours. 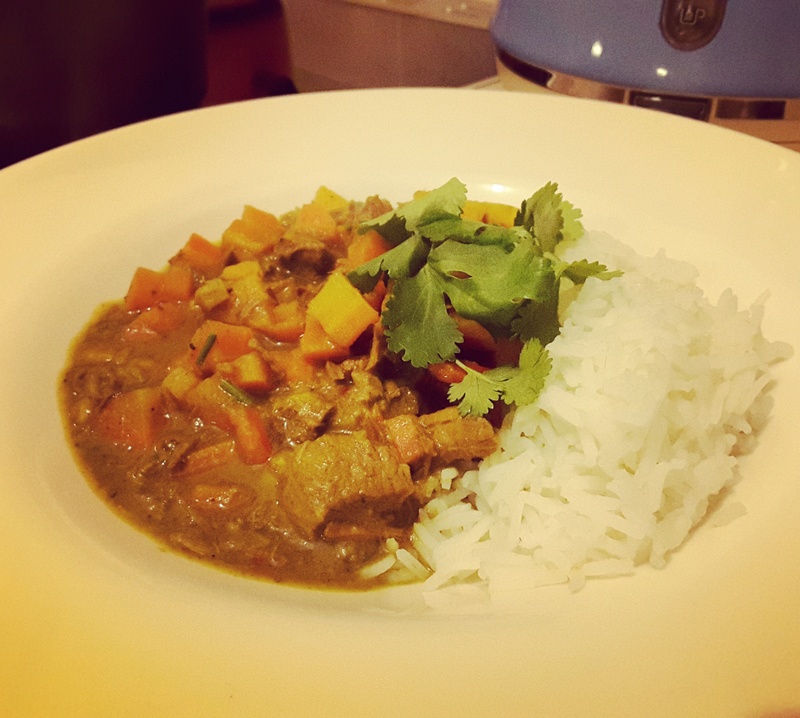 Ideally make the curry one night for the next night as it gives the flavour time to develop. Step 6: The next day bring the curry to the boil and then simmer. Add in the chopped carrot and sweet potato. Cook for about 15 minutes with the lid off. Step 7: Start to cook your rice. Add the red pepper (sliced) to the curry. Step 8: When all done, season with salt and pepper. Finished with some fresh coriander.